Expert Roofing General Contractors takes pride in providing high quality gutter installation and gutter repair services to homes and businesses in the Indianapolis, IN area. We never cut down on quality in materials or workmanship. Customer satisfaction is always a priority for your home or business gutter installation. Don’t let the rain ruin your home. 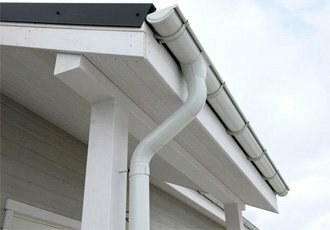 Properly installed gutters provide protection against erosion, plant damage and basement flooding. Clogs and leaks can put your home at risk for moisture damage and wood rot. Additionally, well-functioning gutters and downspouts help direct roof runoff away from the foundation of your house or business and prevent water damage inside your basement or crawl space. Call Dale and his crew and eliminate cleaning & clogging concerns with our quality gutter solutions. At Expert Roofing General Contractors, we know what separates adequate gutters and gutter guards from a gutter protection system that provides fail-safe performance and exceptional value. That’s why we only install the best products available. Don’t wait to protect your home: Get a free estimate today! When you need gutter repair in Indianapolis, IN or the surrounding area call the locally owned experts at Expert Roofing General Contractors. Whether your gutters and or downspouts are loose, leaking, out of alignment, broken, split, separated, fallen down, missing parts, or just flat-out need replacing, we can help. We know that prompt and courteous service is critical when you are in need of gutter repairs to prevent further damage to your home or business. Whether your project is a simple seam leak, or a complete custom install rest assured you’re with the professionals! Since gutters and downspouts are designed to catch the maximum flow of water from your roof line, it is very important to make sure all gutters are free and clear of debris and your downspouts are opened and flowing freely. Most gutter repairs are attributed to either weather or proper maintenance so call us at 317-888-5002 and get your gutters are in good shape!